I took this photo of a beautiful, white lily in Louisiana's Fairview-Riversside State Park. I shot towards the sky, and used a partially overcast sky to give the gray background that serves to almost make this photo look like a painting. Available in the following sizes (Rectangle A): 10x8, 14x11, 20x16, 24x20, 30x24. I stopped for the night at Fairview-Riverside State Park, north of New Orleans, Louisiana, while en route to an art show in Florida, in April, 2016. I was hoping to take some swamp and wetlands photographs while traveling through the area, and this State Park, although small, provided many opportunities. It was still quite early in the morning when I took this photo. Early mornings are always best for still air and smooth lake / river surfaces, which are ideal for reflection shots, such as this one. Available in the following sizes (Panorama B): 30x12, 40x16, 50x20, 50x20 Triptych (3 x 17x20), 60x24, 60x24 Triptych (3 x 20x24), 75x30, 75x30 Triptych (3 x 25x30), 90x36, 90x36 Triptych (3 x 30x36), 105x42 Triptych (3 x 35x42), 120x48 Triptych (3 x 40x48). Louisiana has a lot of unique beauty. I spent several nights camping at Sam Houston Jones State Park, just outside of Lake Charles, and arose early each morning to photograph the swamp adjacent to my campsite. 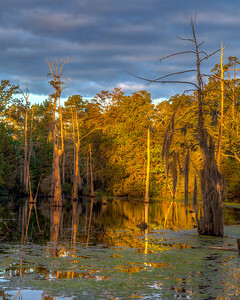 Although this swamp wasn't particularly large, I found a panoramic format lent itself quite well to the location, especially because of the crystal-clear surface of the water, which reflected the trees perfectly. Available in the following sizes (Panorama B): 30x12, 40x16, 50x20, 50x20 Triptych (3 x 17x20), 60x24, 60x24 Triptych (3 x 20x24), 75x30, 75x30 Triptych (3 x 25x30), 90x36, 90x36 Triptych (3 x 30x36). 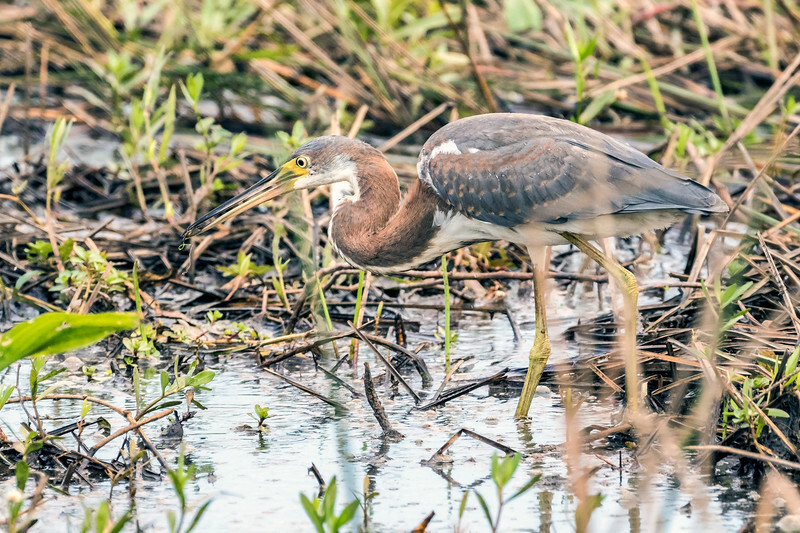 Southern Louisiana's Creole Nature Trail, which extends south of Lake Charles into swamp and wetlands, is an amazing place to capture wildlife photographs. Numerous boardwalks along the route make it easy to walk among the wildlife. This was just one of dozens of alligators I saw while on the Trail. Prior to seeing the alligators along this trail, I didn't know these creatures were capable of being “cute.” But I had to admit it was kind of cute how, when you walked or drove by their resting places in the river, they'd cautiously approach you. I think people feed them, and they've come to accept this as the way of things. Not ideal, but interesting. Available in the following sizes (Rectangle A): 8x10, 11x14, 16x20, 20x24, 24x30. 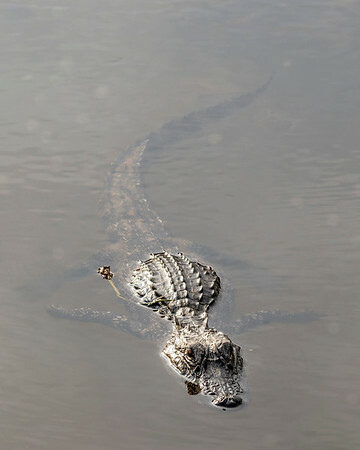 Southern Louisiana's Creole Nature Trail, which extends south of Lake Charles into swamp and wetlands, is an amazing place to capture wildlife photographs. Numerous boardwalks along the route make it easy to walk among the wildlife. This was just one of dozens of alligators I saw while on the Trail. Moments after I took this photo, he retreated into the river, the banks of which he'd been peacefully basking for who knows how long when I took this photo. Available in the following sizes (Rectangle B): 12x8, 18x12, 24x16, 30x20, 36x24. Southern Louisiana's Creole Nature Trail, which extends south of Lake Charles into swamp and wetlands, is a bird watcher's paradise. Numerous boardwalks along the route make it easy to walk among the wildlife, such as this tricolored heron, which I spotted hunting. Available in the following sizes (Rectangle B): 12x8, 18x12, 24x16, 30x20. Louisiana has a lot of unique beauty. I spent several nights camping at Sam Houston Jones State Park, just outside of Lake Charles, and arose early each morning to photograph the swamp adjacent to my campsite. While a far cry from the mountains and deserts that I typically photograph, I found this place to be both fun and beautiful to photograph. Available in the following sizes (Rectangle A): 8x10, 11x14, 16x20, 20x24, 24x30, 30x40. Southern Louisiana's Creole Nature Trail, which extends south of Lake Charles into swamp and wetlands, is a bird watcher's paradise. Numerous boardwalks along the route make it easy to walk among the wildlife, such as this tricolored heron, which I spotted hunting. Available in the following sizes (Rectangle B): 12x8, 18x12, 24x16, 30x20.